For many companies who function predominantly online, face to face interactions with customers and clients seldom happen. Personal relationships are difficult to build when the individuals that your company targets are a demographic statistic rather a specific person with a smile and ambitions. So how can your company connect with individuals and form relationships that last when your business only has one brick and mortar store? Here’s a look at how your business can market to individuals and build the personal connections customers and clients crave. iBeacons are a new technology that utilize a variant of Bluetooth technology called Bluetooth Low Energy or BLE. BLE lets your smartphone or other mobile device, like your Apple Watch Sport, communicate with other enabled devices over a short distance. It consumes considerably less battery than traditional Bluetooth, as its name implies. BLE uses are typically geared toward personalized advertisements. These are one-way transmissions from a beacon, like a computer that sends a message to a smartphone or other smart device. What does this look like for a business? Let’s say a shopper strolls down the street, bag in hand. Suddenly their Apple Watch gives them a notification. The message you’ve set your iBeacon to communicate with mobile devices has appeared. For instance, if you have a vintage clothing boutique, you might program your message as, “Holiday sale, this weekend only, 20 percent off all items.” A moment later the potential customer walks into your shop and they already know why they want to enter your store. Since most of your business is online, an iBeacon is a great way to make the physical interactions you have with customers count. No matter what kind of business you have, your online presence is an essential part of your success. Build a community around your product or service with an online forum. A forum provides a communication hub for customers and clients. Many online forums serve community members in their search for knowledge when they trouble shoot a problem. Let the community you’ve created do part of the work for you in terms of customer support — and it’s a free work force. Of course, the most difficult part is getting this community started. Post exclusive information and materials on your forum, as this will make it an invaluable source of knowledge for your customers. This isn’t necessarily face to face, but you can certainly reach your target demographic in other ways. Increase your visibility with social media platforms like Twitter and Facebook. Ask your customer or client base how you can serve them better. Listen. When those you serve see positive change come about from the input they’ve given, they will spread the word of your service. Never underestimate the impact of word of mouth, even if it’s online. When you take customer input into account and make changes in how your business functions, let people know. A newsletter is worth the effort and reaches an audience that is less connected via social media. Include deals, information, customer success stories and updates to your business model. If these updates were brought about by a certain customer, give them credit or even feature them in the newsletter. This shows the recipients of the email how much you value input from those you serve. Alex Clark-McGlenn is a graduate of the Northwest Institute of Literary Arts Writer’s Workshop. His fiction has been published in the Best New Writing 2016 anthology, The Cost of Paper, Smokebox.net, and others. In his spare time he enjoys cycling, soccer, and reading. He lives the Pacific Northwest. 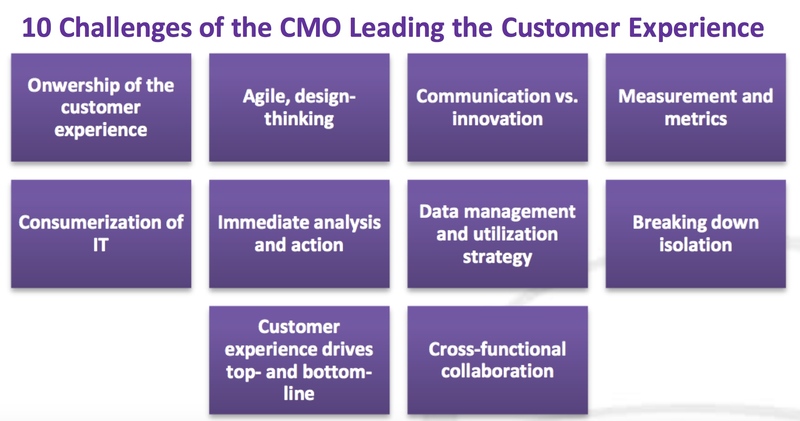 Should the Chief Marketing Officer (CMO) Oversee the Whole Customer Experience? 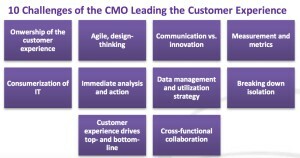 Customers, Value Chain and The Customer Experience Imperative Should the CMO oversee the whole customer experience? Today, the value chain in business has gone from products that became commodities to services that fuel anticipation of superb customer experiences that go beyond anything customers have expected previously. These new customer expectations have put pressure on companies to deliver on these experiences, which affect the revenue, margin and profits of a company. Brands are under a new type of pressure to keep the right customers and ensure that each of those customer’s experiences live up to their customer’s expectations. In order to make that happen, especially in large organizations, someone has to have customer experience as their primary responsibility and also have the clout to improve it. This is not your grandpa’s CRM. It’s starts with strategy and difficult leadership questions. The big question? Who should lead the entire customer experience? With the shift to digital marketing, electronic commerce, social media and mobile interactions, brings a massive transformation to how brands and organizations engage prospects and customers. Customer Experience Management is a major pillar in many B2C and B2B organizations’ efforts to engage and retain customers. As it gets more complicated to engage and retain customers, organizations are realizing there is more to the job of customer experience than many first realized. This is in part because providing superb customer experiences often means getting many different departments or functional areas to collaborate, especially when they had not been in the habit of doing so before. Many times the reason for the lack of collaboration and why it has not happened before is because it’s not easy. Again, it’s not your grandpa’s CRM – it’s not about technology really. It’s really starts with a cultural mindset. Falling Through The Cracks? There are many points along the customer experience journey where an organization can miss the mark and not even come close to meeting customer expectations. However, market leaders realize the future requires proactive, digital online engagement, integrated with in-person and/or in-store experiences to support the strategy. In this research we spoke to many leaders to find out how they are tackling the issues around customer experience and leadership and how best to lead this key strategic initiative in their organization. 1. Confusion abounds on who should lead (own) the customer experience. 2. Agile, design-thinking is required to lead changes needed for successful customer experience. 3. Marketing is often focused on communications rather than innovation, product development and business innovation. 4. Marketing only recently became more accustomed to being highly measured, so building the business case for the additional responsibilities of the “new” CMO role may be difficult. 5. The Consumerization of IT has created often unfulfilled customer experiences. 6. The abundance of data requires immediate analysis and action to provide meaningful mass personalization at scale. 8. Marketing can be isolated from other departments that affect customer experience and that isolation hurts the ability to lead change. 9. Marketing can be isolated from other departments that affect customer experience and that isolation hurts the ability to lead change. 10. Customer experience requires a highly collaborative individual to lead cross- functional collaboration. In the next part of my series, I’d like to feature Bluenose. Bluenose Analytics offers a customer success platform that allows SaaS businesses to manage customers with complete visibility, a robust early warning system, and built-in playbooks. Bluenose’s co-founders were both born in Halifax, Canada. They named the company for something they had in common. The Bluenose is a well-known racing sailboat from Halifax, a schooner with three masts that competed around 1900. The Bluenose was virtually undefeated in competition. Before the opt-in economy, many businesses focused on the initial sale. Organizations spent a significant amount of money on advertising and marketing to potential prospects. The goal – enticing them to convert from a lead to a sale. Despite decades of research showing that after-sales service directly affects the financial stability of a company, organizations paid little attention the after-sale experience and financial longevity of the client. Consequently, organizations never should have spent millions, or in some cases, billions of dollars in advertising, marketing and sales to then drive the customer to a competitor when the after-sales service experience was horrible. Yet, poor after-sales service occurs every single day in many, many companies. Customer Success Management (CSM) is based on the ability to deliver a consistent customer experience process – before, during, and in particular, after the sale – which results in maximized customer lifetime value and enhanced revenue that leads to increased margins and profits. A shift to CSM happened because we live in a continuous, opt-in economy, where the value of customers is determined by how long they stay customers and if they continue to increase their purchase amounts over time. Because of our opt-in economy, companies must prepare themselves to deliver great, continuous and consistent customer experiences. When choosing the best option for CSM software for your organization, the choice will depend on the business goals of CSM initiatives, the degree to which CSM has been integrated into your culture and how well employees have adopted this mindset. 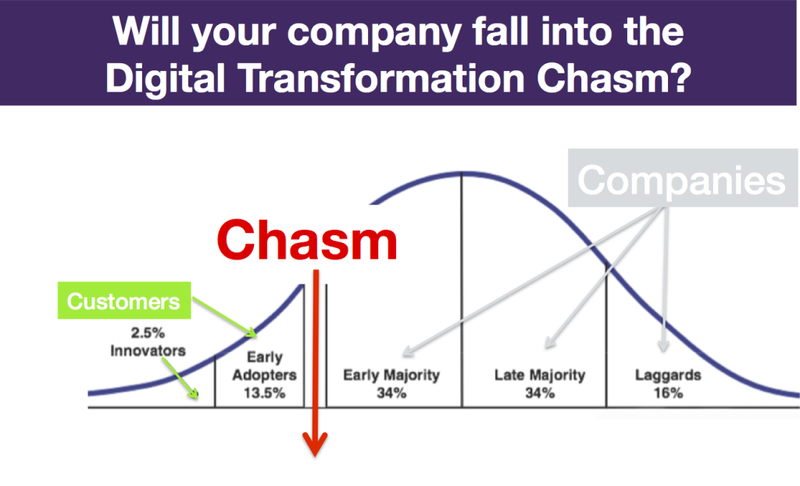 It may be that some organizations will be further along the adoption cycle, while others will need internal champions to encourage and enforce the use of customer success software, processes and best practices. The CSM field has been spurred on by the need to provide after-sales service intelligence that can be turned into actionable insights and decisions. 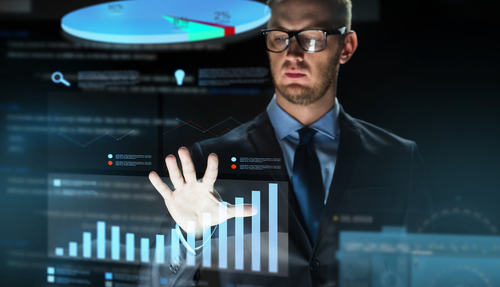 Holistic, data-driven decisions require a multi-disciplinary approach that incorporates performance monitoring with traditional business intelligence technologies. 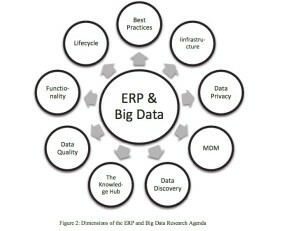 A multitude of data sources can be transformed into information streams guided by business process. As context is applied to information streams, patterns emerge that provide nuggets of insight. That insight then drives the ability to take action and make better decisions. This shift to using insight not only can serve high-margin, “luxury” brands, but also should be considered for all businesses through an investment in CSM. By transforming business models to include processes that immediately turn data into decisions, brands and organizations gain the ability to provide great, loyalty inspiring experiences that reduce churn and increase revenue. Delivering a brand promise instead of a product or service requires new approaches. The onus of delivering on the brand promise – providing great experiences with a company no matter when the customer interacts with it – is putting new pressures on brands and software vendors. This means the business model of both must shift. A company’s business model must move post-sales care to a more mature level. This evolution requires a different mindset and approach to customer lifetime value. CSM cultivates more customers, lowers churn, and improves margins. The reason many companies have adopted the opt-in business model is that they realize, when they consistently deliver great experiences, they have loyal customers who advocate for the brand and often will make referrals. Advocating for the brand can be in the form of a post in a social network or offline in telling friends or family of their experiences. Predictive analytics identify known attributes and reveal previously unknown attributes that drive customer success. The only way to preserve a company’s revenue stream is to keep customers opting in. To become a CSM organization, a company has to actively manage customer relationships to ensure the customer is getting value. This critical step requires data in the form of real-time and predictive analytics. Integration of the Internet of Things and predictive analytics improves precision of decisions. The amount of data and analytics that CSM platforms provide is important, especially when data from sensors and other sources (that make up the Internet of Things) is integrated into the solution to provide a company with predictive analytics and actionable insights that drive better and more precise decision making throughout an organization. See “The State of Customer Success Management 2015” by Natalie Petouhoff, Constellation Research, December 22, 2014. Welcome back to Part 2 of my vendor profile of ServiceSource®. If you’d like the full report, just scroll to the bottom of this post! Be sure to check out my vendor profile of ServiceSource®. An excerpt of the profile including the table of contents is available to download. Henry Ford, an innovator in personal transportation said, “A business absolutely devoted to service will have only one worry about profits. They will be embarrassingly large.” Nearly a century later, the number one reason a customer recommends a business to another customer is still outstanding service. Some things never change and they never will. But it’s up to brands and the senior leadership team to truly embrace this and support it with resources: people, process, strategy and technology. The right technology with the wrong strategy, only means you will be doing the wrong things, faster. While delivering superior customer service has continued to be a key differentiator for companies, some things have changed forever. Today there are more channels, devices, and technologies. Customers’ behaviors have changed and so have their expectations. To win business and your customers’ loyalty, you have to deliver a modern service experience. If no one knows about your product or service, no one is going to buy it. Marketing is very important to get the word out and make sure your customer acquisition is high. The content for marketing is one of the most important aspects on marketing, especially in the digital era. People do a ton of research on products and services online before they buy – either online or in a store. So making sure you are reaching your key target audience is key — but so is making sure your content is relevant, humanized (doesn’t sound like boring, corporate speak), authentic and genuine is key to getting or keeping the attention of our attention deficient audiences that are so prevalent today. Is your marketing modern? Have you changed your marketing practices? Are you listening to what customers are saying? Often times creatives struggle with how to come up with new “catch phrases” or how to describe a new product or service. It doesn’t have to be difficult. Often listening to online conversations (just like many companies held in-person focus groups) you will understand more about the customers you are targeting and be able to kraft messages that are truly meaningful. And you’ll want to use analytics in your marketing to make sure you are targeting the best audience with the right messages at the right time. And then there’s channels and distribution of content on those channels. Marketers have more to do today than ever. Often customers read what’s posted in social networks about a product (think product review sites) or posts about how they have been treated as well as garner insights and research from respected analysts, journalists and bloggers. Most information that decision makers collect and act on comes from their network. People—not databases or reports—form the primary source of information they use to formulate and validate decisions. And today’s personal network extends far beyond just the people they talk to in person. It reaches out to hundreds and even thousands of people, in nanoseconds, via social networks. And that’s in part, why it’s important to make sure your Marketing Content and Customer Service are aligned with your Sales initiatives. What’s your take on intertwined marketing, sales and customer service?